This park was known as Cypress Gardens at the time this report was written. The decision to visit Cypress Gardens today was made at the last minute thanks to a very unfortunate discovery; the park is the only one in the greater Orlando area that closes completely for the Thanksgiving holiday. As such, it was necessary to make a flying visit in a day that already had other plans, meaning there was only enough time to ride the two coasters added since my last visit. 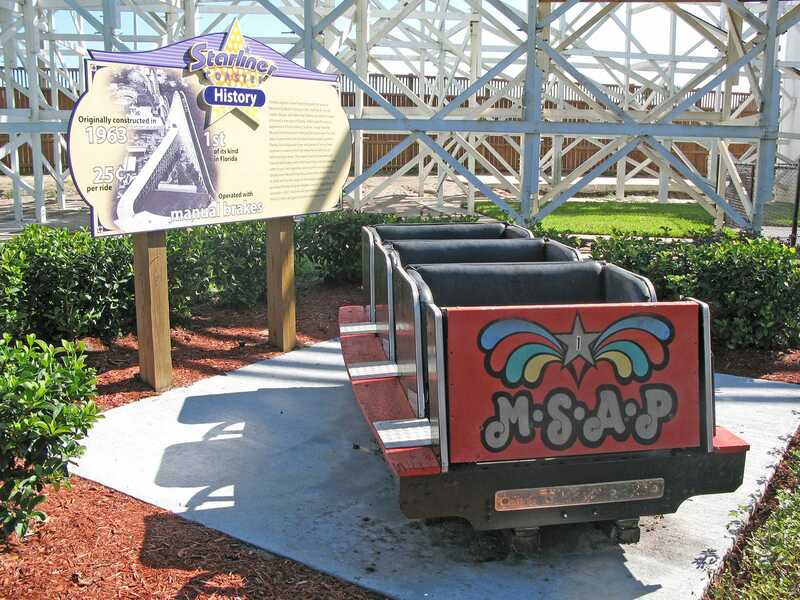 Of these the primary draw was obviously Starliner (#1097), a classic wooden coaster relocated from the now defunct Miracle Strip Amusement Park. There obviously isn't going be much competition from a park that no longer exists, but nevertheless it was still surprising (and great) to see a car from the original location and a history board telling the story of where this coaster came came from. The idea of moving a wooden coaster is a bit of a misnomer to be honest; the track will clearly need to be completely replaced in the new location. Be that as it may, this 1963 classic was running very well, with a surprising amount of airtime. The only down side is that seat belts have been retrofitted to the ride, which serve no real purpose other presumably to humo(u)r the park insurance company. It is at this point that I'd like to issue a warning to all readers of this diary. Never be tempted to ride a spinning mouse coaster on your own, even if you need the credit. My experience on Galaxy Spin (#1098) was so extreme that I could barely walk upon disembarking. For reasons of public safety a nearby park bench was an absolute necessity for a good two minutes. The forces were substantially stronger than those experienced on a european Waltzer (i.e. with someone deliberately spinning the cars). Amazing stuff to be sure, but there was no way I could ride a second time even if I wanted to. Uncle Bernie's Theme Park is situated in the middle of a large flea market, itself located next door to that pinnacle of Americana, a fourteen screen drive in cinema. We would not have stopped here were it not only a few miles away from our next target park. As it was, it didn't take long to ride the Abandon Mine (#1099) or the powered Dragon, and we were soon back on the road never to return. The Boomers chain is to small family entertainment centres what Six Flags is to large corporate parks. Many branches have small kiddie coasters, and indeed my travels have brought me to one of those in the past. The outlet in Florida is the only one with a proper sized coaster, and that's a shame really as it's a wonderful ride. 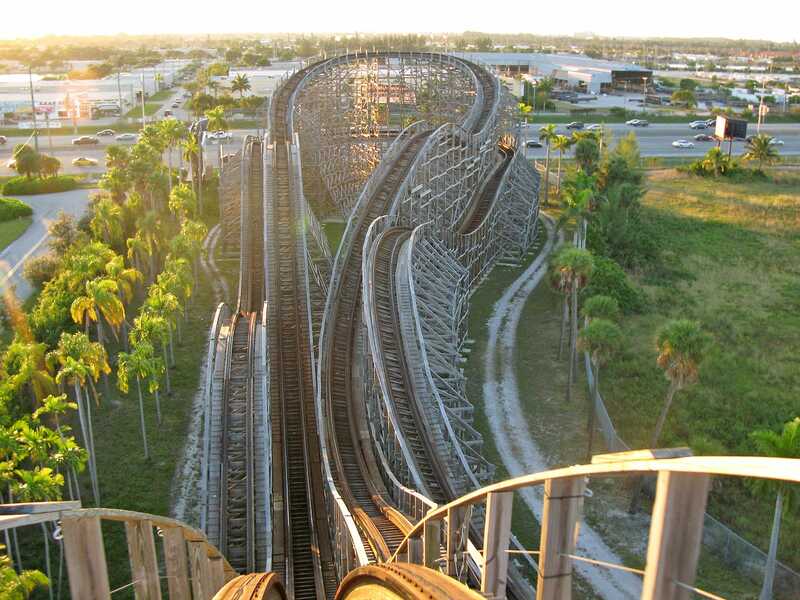 Dania Beach Hurricane (#1100) is a top notch wooden coaster, and well worth the three plus hour drive from Orlando. It has been placed directly next to a motorway, providing the type of advertising that money can't buy; even a non enthusiast could easily be tempted to make a quick stop in the midst of a long drive. In the run up to this trip I spent a bit of time researching whether there might be any travelling coasters operating in the Florida area. For some years now I've wanted to track down the Schwarzkopf-built Doppel Looping, and though this was nowhere to be found (and indeed hasn't been for several years) I did at least manage to turn up two rides operating in the Fort Lauderdale area. The first was a Zierer Flitzer by the name of Racing (#1101), the latter word clearly a recent and possibly temporary retrofit; other than the new banners the ride could as easily have been its brother in Bakken. A little way down from it could be found the much smaller Orient Express (Reithoffer - Oval) (#1102). We must have had twenty laps of this track; I wasn't counting, but George said he gave up after ten.